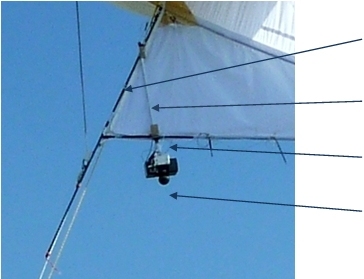 Most other aerostat designs subject their cameras to be dangled on the ends of loose lines hanging below the aerostat. This is not good enough, especially in the high winds, because loose lines cannot keep payload steady enough. Unsteady cameras give very poor performance and may well upset the flight of the aerostat. Cameras need to be kept steady whilst also having a good field of view below the Helikite. Also, the camera must not interfere with the safe ground-handling of the aerostat. So Allsopp Helikites Ltd has designed a revolutionary new solid and reliable airborne camera attachment system for still and video cameras. Cameras are not left dangling in the air, but instead are bolted firmly to a strong monopod on the stiffened keel. A superb “Steady-Cam” Damped Pendulum Mount can be attached to the monopod to keep cameras automatically in line with the horizon. These camera attachment systems allow the camera a 360 degree view of the ground whilst not compromising the steady flight of the Helikite, even in high winds. Ground handling is safe, and expensive cameras are protected from the ground during launch and recovery. Stiff Carbon-Fibre Rods – Provides solid mounting points, reduces vibration and swaying. Strong Aluminium Bar Monopod – Stiff camera mount easily detachable from carbon-fibre rods. Damped Pendulum Camera Mount – Allows camera to smoothly hold itself horizontal with the horizon. Excellent 360 degree view of the ground for camera. Lightweight cameras can also be placed with care around the circumference of the balloon to give all round vision if required. Allsopp Helikites Ltd also have proprietary methods of placing cameras on the flying line, which is sometimes useful. Sensors such as wind meters and radar can be attached in the same way as cameras.